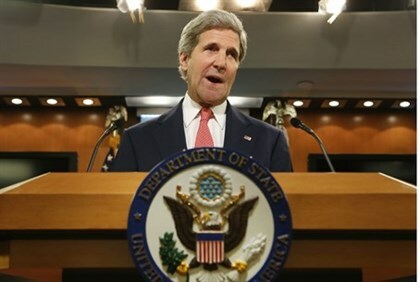 U.S. Secretary of State John Kerry said on Friday it would be inappropriate for Iran to attend an upcoming meeting in Paris on how to defeat the Islamic State group, The Associated Press (AP) reported. Speaking to reporters in the Turkish capital, Kerry said he has not been formally asked about whether Iran should participate in the meeting of diplomats set for Monday. However, he added, Iran should not be there, given its support for Syrian President Bashar Al-Assad in his three-year war against rebels that are trying to oust him from power. Kerry is in Ankara to press Turkey to join an international coalition against the Islamic State, a day after he received the backing of 10 Arab countries for a “coordinated military campaign” against Islamic State fighters. Those 10 countries are Egypt, Iraq, Jordan, Lebanon and six Gulf states, including rich rivals Saudi Arabia and Qatar. Kerry held talks with the Arab countries in Saudi Arabia on Thursday, but Iran was excluded from the, as was Syria. Kerry met the Arab leaders to drum up support a day after President Barack Obama announced his plans to strike fighters in Iraq and Syria. Last week, it was reported that Iranian Supreme Leader Ayatollah Khamenei had authorized his army to coordinate joint military operations with the United States against IS in Iraq. The State Department later clarified it has “no plans” for any military coordination with Iran in the fight against Islamic State.